The Governor of Ekiti State, Mr Ayodele Fayose, has raised alarm over what he calls a plan by the ruling All Progressives Congress (APC) to upturn the judgement of the Supreme Court on the 2014 governorship election. Mr Fayose at a press conference in Lagos on Sunday said that there were attempts by the ruling party to use the military inquiry reports when delivered to upturn the Supreme Court judgement. The military had constituted a panel of inquiry into the operations of its officials in the governorship election, after the APC alleged that the military connived with the Peoples Democratic Party (Mr Fayose’s party) to rig the election in Fayose’s favour. Governor Fayose also warned that the situation was capable of killing Nigeria’s democracy, insisting that the governorship election that brought him in was the best. He claimed that foreign observers had expressed confidence in the process. The Ekiti Stat Governor, however, urged the Federal Government not to allow any decision capable of disturbing the nation’s democracy. “I want to remind them that they are on the verge of destroying democracy in Nigeria. Nigerians, their votes and their views must be respected. “If the International community said it went well and the US said it went well, I am saying it expressly, Ekiti election was the best. “The consequences of dictatorship is the fall of the dictator. It is either he treads softly and remember the same Nigerians who gave you opportunity after several attempts. We cannot be muscled,” he stressed. 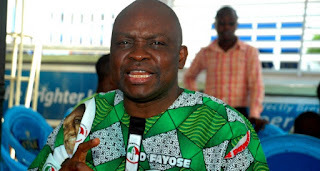 The All Progressives Congress dismissed Mr Fayose’s statement, saying it had no plans to come in the way of justice.